Leader of Sweden’s Social Democrats Stefan Lofven has announced he will try to form a government after their election win, but will not work with the far right. 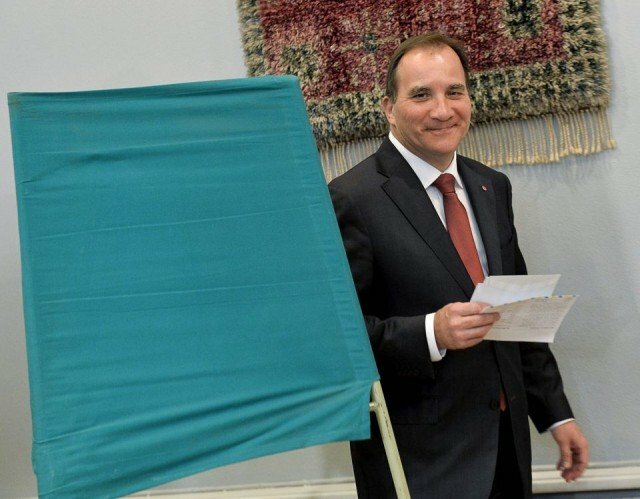 Results show Stefan Lofven’s opposition party is set to return to power, but with no clear parliamentary majority. They give the centre-left bloc 43.7%, ahead of the 39.3% for PM Fredrik Reinfeldt’s Moderate Party. The far-right Sweden Democrats were at 13%. Fredrik Reinfeldt admitted defeat and said he will step down as prime minister on September 15. He also confirmed that he would step down as leader of the conservative Moderate Party. Stefan Lofven said the country needed a “new direction” and faced major challenges after eight years of centre-right rule. “We are in a serious situation. We have thousands of people unemployed, We have school results that are declining more than in any other OECD [Organization for Economic Co-operation and Development] country,” he said. Since coming to power in 2006, Fredrik Reinfeldt’s coalition government has cut income and corporate taxes, abolished a tax on wealth and trimmed welfare benefits. It has also privatized several state-owned companies, including the maker of Absolut vodka. The results signal a return to normality in Swedish politics. The Social Democrats have not been in opposition for so long since first taking power in 1920. With more than 99% of votes counted, the Social Democrats, Greens and Left parties looked set to win around 159 seats in the 349-seat parliament, short of a majority. Stefan Lofven told supporters in Stockholm that he would now explore the possibilities of forming a government, but would not cooperate with the Sweden Democrats. The far-right anti-immigration party are set to become the country’s third largest party. Correspondents say they could hold the balance of power. “We’re the absolute kingmaker in parliament now,” Jimmie Aakesson, leader of the far-right party, told reporters. However, Stefan Lofven insisted he would not turn to the far-right party. “We will make sure they don’t get that kingmaker role,” he told supporters. The Sweden Democrats, who entered parliament for the first time in 2010, are alone in opposing the country’s liberal immigration policy. Sweden this year expects up to 80,000 asylum-seekers from Syria, Eritrea, Somalia, Afghanistan, Iraq and other countries – the highest number since 1992. Meanwhile, results confirm that a small feminist party that had hoped to enter parliament failed to reach the 4% threshold.